In the afternoon, the Opening Ceremony is planned to take place in front of the famous City Hall of Vienna, which was designed by Friedrich von Schmidt in the Neo-Gothic style and built between 1872 and 1883 (http://www.wien.gv.at/english/cityhall) and is one of the most important buildings in Vienna. Note: All orchestras are welcome to attend the opening ceremony as audience. After the Opening Ceremony, there will be a Special Concert in front of the City Hall of Vienna. Under the requests of orchestras, further special concerts in and around Vienna will be also organized for presentation of the orchestras. Note: orchestras can apply for performance in the concert. The concert will be shared with other orchestras. In the evening, the Festival Committee invites the representatives of each orchestra to join in the first meeting with dinner at an typical Viennese style Heuriger restaurant: "Weingut Mayer am Pfarrplatz", where Ludwig van Beethoven lived and composed his famous Symphony No. 9. Note: only orchestra representatives should attend this event. 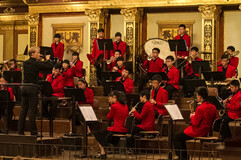 Workshops will be provided at the University of Music and Performing Arts in Vienna, which is one of the most famous music universities in the world. Univ.-Prof. Helmut Zehetner, the president of the Artistic Committee of the World Orchestra Festival and member of the Vienna Philharmonic Orchestra and professor at the University of Music and Performing Arts in Vienna, with other music experts and educators will coach the orchestras with different themes and techniques. Note: All orchestras can apply for getting workshops. Workshops will be provided at the music guards of The Austrian Armed Forces (at the Maria-Theresien-Kaserne). Colonel Mag. Bernhard Heher, Head of the music guards, and his colleagues will coach wind orchestras with Austrian music works and methods. 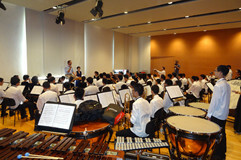 Note: All wind orchestras can apply for getting workshops. Further Special Concert will take place in front of the City Hall of Vienna. Under the requests of orchestras, further special concerts in and around Vienna will be also organized for presentation of the orchestras. Orchestras participating in the category "Competition" will make their debuts in front of the international jury, consisting of world well-known orchestral conductors and educators. The competition will take place at the Vienna Boys Choir Concert Hall "MuTh". For details please read the chapter "Celebration and Competition". In the evening, a dinner and party will be organized to give all participants to refresh, to play music, to sing, to dance and celebrate together, a great chance to make new friends from other countries. An Austrian folk music group will accompany through the night. Note: all orchestras are welcome to the dinner and party. Application in advance is necessary. The rehearsals and gala concert will take place in the famous Golden Hall of Musikverein where the famous New Year's Concert of the Vienna Philharmonic Orchestra takes place every year (www.musikverein.at). 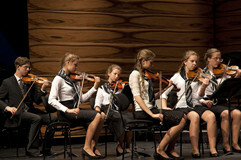 It will be one of the highlights of the festival and give the orchestra members an unforgettable memory. Note: all orchestras can apply for its stand-alone performance on the stage of the Golden Hall.